Used on asphalt and paved areas, as well as green areas. Krinner ground screws uk are the ideal foundation for highways and rail applications. Ground screw provides highway signs suppliers, highway engineers and contractors an ideal installation method for road signage requirements. 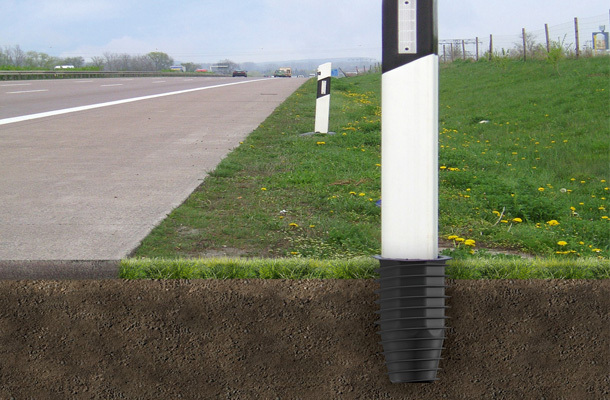 There are a range of Krinner ground screws to suit the variety of road sign posts and masts. In addition, installation time is unbeatable, on average seven times quicker than traditional concrete installations. The krinner ground screws uk are approved for use with passively safe supports and accepted by the Highways Agency for use on motorways and trunk roads. The ground screw foundation is also used trackside and off-track in platforms, car parks, bridges, tickets (turnstils) and holds Form A and Form B approval. Ground screw installations are a fast, reliable solution for all rail requirements. A single ground screw can replace one cubic metre of concrete. As an example, a complete set of refuges could be erected in one shift, significantly reducing possession time.